WhatsApp is by far the most used Social Media application. Thus by Integrating this social media platform with your CRM like Zoho, Zendesk, Salesforce/ERP/Accounting software like Tally/E-Commerce portals like Shopify, Magento/Existing System you can reach out to your customers on their WhatsApp. You can also provide notifications, alerts, status and transactional updates on WhatsApp by integrating with any of your existing software. Also With UMS Tech Labs there is an optional facility to automatically fall back on SMS in case the contact is not registered on WhatsApp. IF an agent clicks on click to WhatsApp button in the CRM THEN WhatsApp is sent to the customer and CRM/Google Apps Integration captures data in the Google Sheet/CRM. IF you integrate the API with your existing system (Example Tally) THEN send automated notifications/alerts to your customers (Example invoice) on their WhatsApp. With the WhatsApp Integration API available, you can integrate WhatsApp with any of your existing system. This ensures a tight and seamless integration with your current system and higher adoption. WhatsApp Business Integration & Automation is possible with this API. This WhatsApp API can be easily integrated with accounting software like Tally. 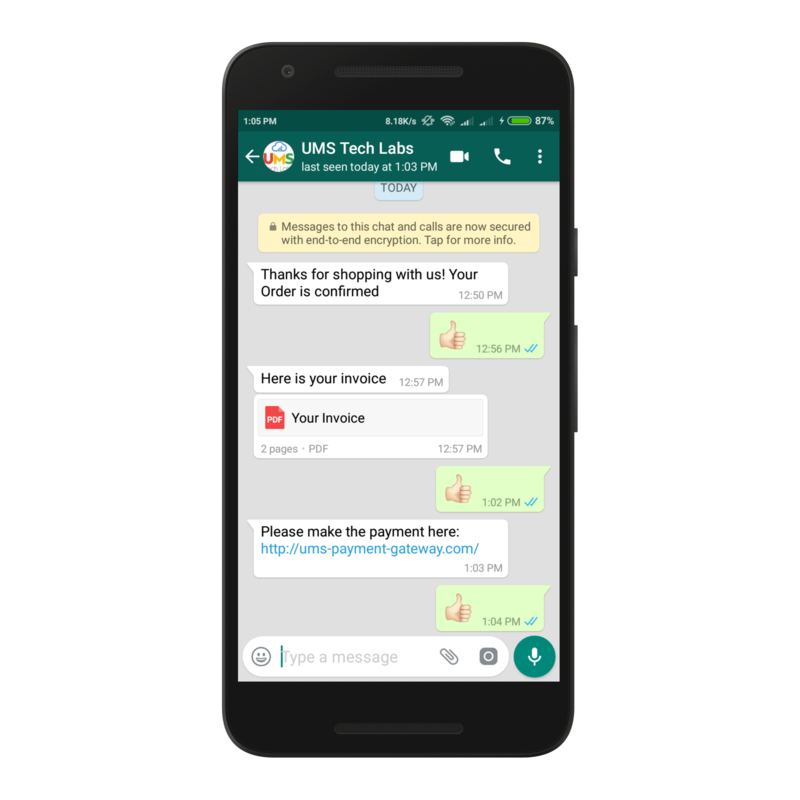 With Tally WhatsApp integration you can instantly send invoices to your customer through Tally as WhatsApp Automation. With this API for WhatsApp Integration you can also push reminder message to your customers. Reminding them of their appointment ensures higher productivity and efficiency of your systems. Your customers will like to hear from you on WhatsApp. With transactional & status update alerts provided on WhatsApp the customers would want to be loyal with you. This is sure to make your brand more noticeable. The added advantage is you can save on your International Message cost. WhatsApp Integration with your system offers you to push Transaction and Status updates to your customers on WhatsApp easily. 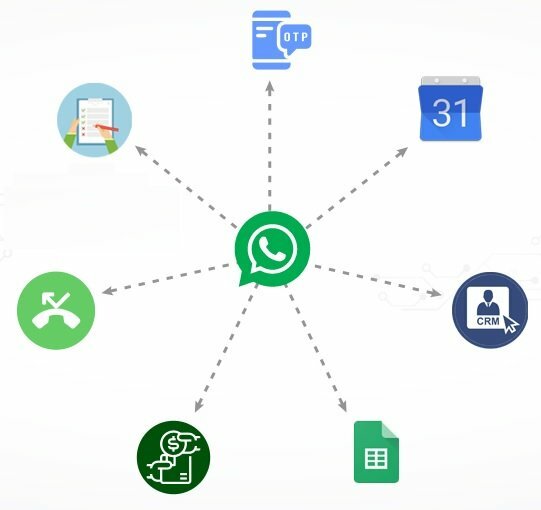 WhatsApp Business automation is the Future. With this WhatsApp API you can send Images, PDF, Word, Excel to on WhatsApp. These can be your product catalog or just a timely birthday wishes. A reliable WhatsApp automation can be achieved. * Rs 25,000 (USD 350) for 1,66,000 (166k) WhatsApp messages. Validity 1 year. Per day Limit of 2000 messages. We have sent you a WhatsApp message on your registered number. Please check your WhatsApp and reply to it to see your response on clicking on the "View your response button."